Elephants don't forget. 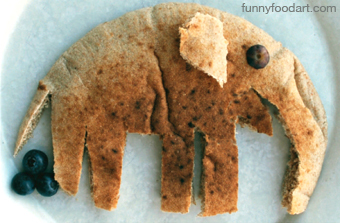 Neither do kids when they make a fun breakfast like a pita elephant with artistically placed blueberries. 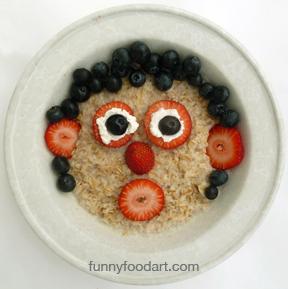 Or a bowl of oatmeal staring at you. 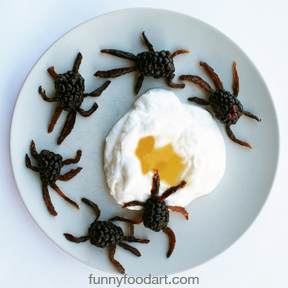 Who can forget berry bugs crawling on yogurt & honey? How do we get our kids to remember how and why they should make healthy food choices? Brain research gives us some answers. Novelty grabs our attention more than a passive lesson on nutrition. When children are involved in a playful activity, it puts them in a good mood. Using their five senses ensures long-term vivid memories. Bill leads Funny Food school workshops by "showing" more than "telling." When kids see colorful, outrageous images of food from our book, they get excited. They are enraptured watching Bill create new breakfasts using fresh, healthy ingredients. 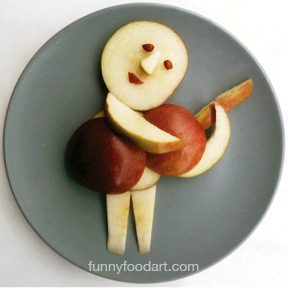 Bill also plays his guitar and has the kids sing a Funny Food song-yet another sensory experience. 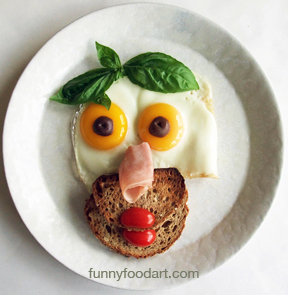 Then it's the children's turn to let their imaginations loose, making their own healthy, fun breakfasts. In the process, they study the food on their plate, smell, touch and taste it, using all of their senses. The kids don't even realize how much they are learning and storing in memory from this experience. See our website and like us on facebook.